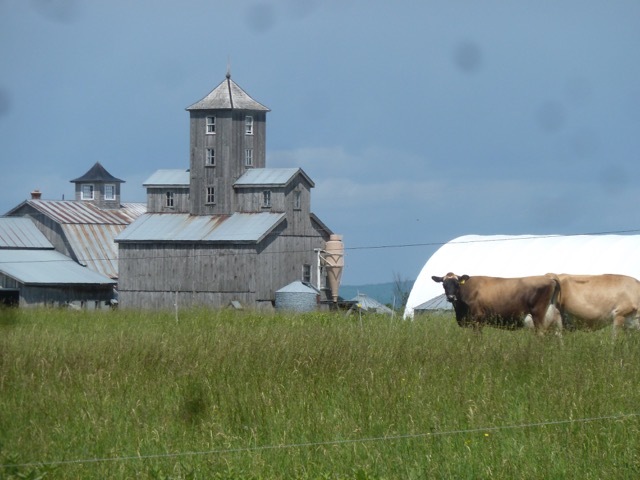 “Paying attention to the nuances of the land, I’ve learned to grow really high quality forages, protein, and energy.” Jack and Anne Lazor, Butterworks Farm, raise their herd of Jersey cows on pasture and high-quality forages in Westfield Vermont and produce a certified organic yoghurt. 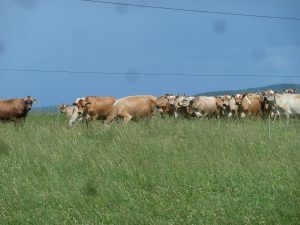 During years of drought, Butterworks Farm has been short on feed for their herd of Jersey cows. They have relied upon increasing their land base to provide more summer forage and more hay in the winter. Jack noted that maintaining good grazing practices during drought was crucial to the health of the entire agroecosystem. Specifically, his rule is grazing down to only 3-4 inch height, instead of down to the ground or only 1 inch. He said, “If you want them to regrow quickly, don’t brutalize them.” That requires more land base, which not all farmers have. Management decisions are informed by weighing a complex set of goals, challenges, constraints and opportunities. Butterworks Farm is transitioning away from grains because there are so many challenges, some of them directly or indirectly climate related. Jack says, “Though I love it, its not financially viable.” The farm is striving the make a transition into the hands of the next generation while reasserting a strong presence in the organic dairy market, though these trends are informed by, but not driven by climate change projections. Jack recounted the history of the economic successes and trials of his business over the last 40 years, explaining that when the yogurt business took off and the business was flush with cash, they were able to not only purchase extra equipment and amendments, but also invest in the ecological sustainability and climate resilience of the farm. In this way, Jack linked the farm’s capacity to invest in new adaptive management strategies directly to the financial stability of the farm and market opportunities. Since 2008, the farm has experienced a decline in skim milk yogurt sales, which has dominated much of the farm’s strategic decision-making. Making the investment into good soil and committing to regenerative agriculture takes a leap of faith, time and money, and Jack sees that some farmers are afraid of that. 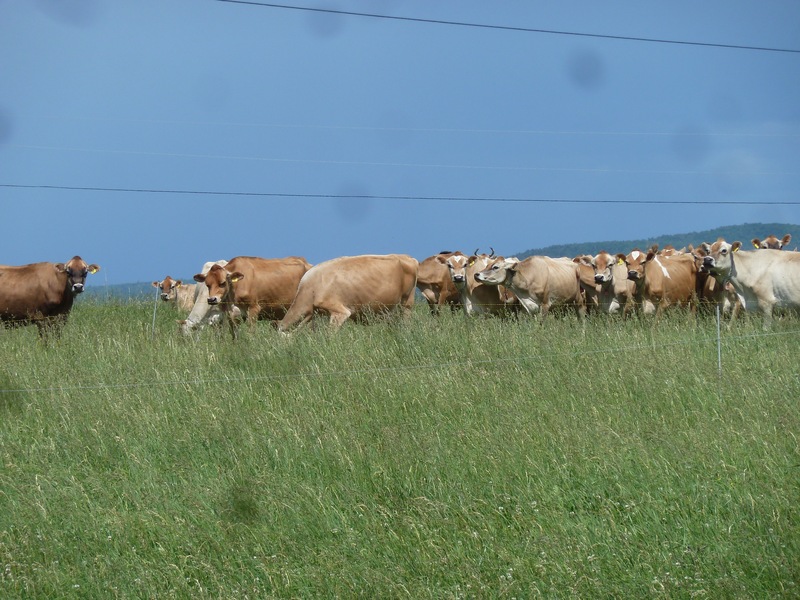 In Jack’s experience on the land, he sees the return on his investments into the minerals, soil amendments, cover crops and equipment show up in the health of the soil and the plants, and then in the health of his cows and quality of milk and cream. Jack emphasized the importance of developing a carbon consciousness. Agriculture has a lot of potential to offset the greenhouse gas emissions in multiple ways. We know that some carbon is captured by perennial, reduced tillage and other systems that increase organic matter, but exactly how much is captured is difficult to measure. Further research is needed on the carbon sequestration potential of grazing systems, and innovative manure and tillage methods. We should be proactive about this, even if the exact amounts of carbon sequestration or reduction in greenhouse gas emissions are unknown- every bit counts! Contributing author: Alissa White, Research Specialist, Agroecology Livelihoods Collaborative (ALC), visited Butterworks Farm in April 2017. Suzy Hodgson, UVM Extension Center for Sustainable Agriculture, visited in June 2017.